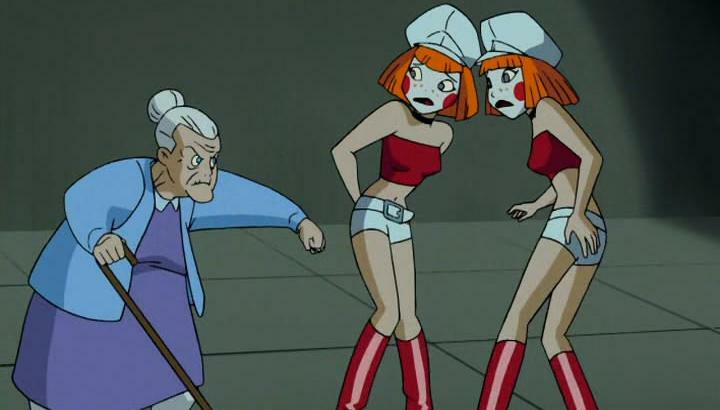 Batman Beyond introduced us to Dee Dee, the twin granddaughters of Harley Quinn. The “Batman Beyond” cartoon presents an interesting future for the DC Universe, and it occasionally crosses over with the Justice League/Justice League Unlimited timeline. Those cartoons are great to watch, and Comics on the Brain happily views them as often as possible. In one recent viewing of “Justice League Unlimited,” the heroes manage a time-shift that vaults them into the familiar future mapped out in the “Batman Beyond” cartoon. There, the “regular” heroes battle a number of “Batman Beyond” villains, including an amusing pair of acrobats, named Dee Dee (Delia and Deidre). Dee Dee, once you see them in action, are hard to forget! This pair is delightfully designed. They have short red hair, wear trendy painters caps and don skimpy outfits that color-match a simple face makeup style. Further, they’re amusingly talkative and chat to one another through all their adventures. One clever quirk in the duo is that they rarely actually talk to their quarry, instead all their chatter involves a running commentary between the two. What makes them into supervillains? Well, aside from being a bit loopy, they’re just skilled acrobats that work together incredibly well in a fight. In the “JLU’ alternate timeline, they’re a bit different. Sure, they’re still loopy and acrobatic, but they also earn a superpower! In this twist-on-the-future, they’re gifted with the power of kinetic duplication — anytime one of them is hit, a duplicate Dee Dee is created. At one point, there’s six or seven Dee Dees at once! All in all, Dee Dee is cool and memorable villain team for the Terry McGinnis (aka Batman Beyond). But there’s something even more awesome about them — they’re the granddaughters of Harley Quinn! Yep it’s true! And, don’t get upset if you think these two animated characters somehow tarnish Harley Quinn’s uniqueness. They absolutely don’t. In fact, it makes perfect sense for Harley’s heritage to be explored in an animated feature. Remember, Harley Quinn got her start in “Batman: The Animated Series,” of which “Batman Beyond” is a continuation. If you think about it that way, it’s ultimately the producer’s right to provide a direction for her character, and a pair of kooky twin granddaughters seems just about right! Further, there’s a chance for Dee Dee to show up in the comics. Yes, Dee Dee did have their origins in an animated universe, but the seeds have been planted for their existence in the larger DC Universe. Where is Harley Quinn’s daughter? Is this the mother of Dee Dee? 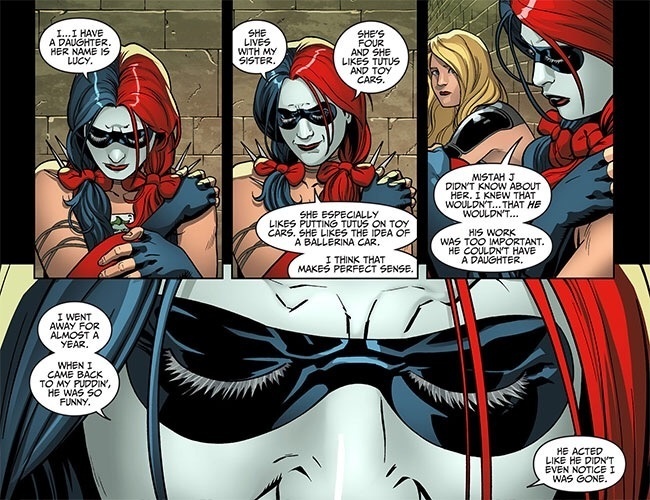 Of course, the only bad part about Dee Dee being Harley Quinn’s granddaughters is that we’ll only rarely see them! Their lives are forever played out in the future of the DCU, not our present. Even with “Batman Beyond” and “Legion of Superheroes” comics on the stands, there’s only so much room for Dee Dee. A shame really, these girls are a really enjoyable pair. Will we see more of Dee Dee? Hard to say, but we’ll keep our eyes open! I’ll have to go back and watch Batman: The Animated Series again one day. It’s been years, and I didn’t realize that’s when we were first introduced to Harley Quinn. So much about the Batman universe I have to learn.